Unlike most other forms of heating, Infraglo's radiant overhead heaters provide almost instant heat; within 2 minutes the heaters have attained a radiant face temperature of approx 950°C. There is no other form of heating so contollable. The heaters can be turned off as quickly as they are turned on by either manual control, thermostat or time switch so the wastage of fuel is kept to an absolute minimum. 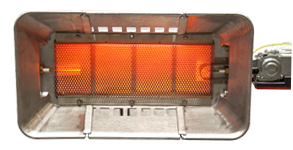 Infraglo's 700 series space heaters are fully automatic in operation having spark ignition and flame monitoring. In the event of flame failure, lockout of the appliance will ensure complete safety; the unit can be reset by interrupting the mains supply. The heaters lend themselves to control by time clock, thermostats or energy management systems. Our heaters are the safest on the market. Ideal for workshops and factories, our heaters provide instant heat with minimal loss only where you need it. The heaters are silent and do not move dust particles around the air. Recomended for commercial and industrial applications where full or localised heating is required. From the smallest factory to the largest, the capital cost of many new radiant systems can be recovered in 12 months or less, by the savings in fuel costs that are achieved; in other cases up to 90% have been achieved by some of our customers with the introduction of 'spot heating' i.e. by heating only small areas in large workshops where staff are working.